Increase the efficiency in your deli simply by bringing the 12” medium-duty meat slicer from Avantco into your kitchen! Whether you have a small butcher shop or a market selling meats and cheese, staff and customers alike are going to love the quick, consistent results they get from this machine. Plus, it's fairly priced to give you a quality slicer without breaking the bank. This slicer features two knobs, one for switching from manual to automatic and one that changes the thickness of your cut. This unit gives you complete control over the thickness of your meat and can slice up to 9/16” thick! With a rear mounted thickness stop, this unit is great for both new and experienced employees. This thickness stop allows the user to set a common thickness and also lets them quickly adjust this thickness when switching between foods. Your customers will love the consistency they will get when you use this Avantco meat slicer. What sets this meat slicer apart from the rest is its unique horizontal clamp. While every slicer has to have the vertical clamp that pushes the meat into the blade Avantco’s unique design also includes a horizontal clamp to keep the food in place while slicing. This is especially helpful with oblong pieces of meat, or any product that has an irregular shape. And with a ½ hp motor, you can rely on this Avantco slicer to stand up to frequent use. With a razor sharp 12” blade, this slicer can do 40 slices per minute in automatic mode to keep up with high demand. The removable, built-in sharpener makes sharpening simple and easy, and you just need to take the sharpener out to be cleaned on occasion. Whether you need to slice a wide range of meats in your deli, or if you have to cut a combination of meats, cheeses, and vegetables, you can count on the Avantco 12” automatic meat slicer to get the job done. The perfect solution for your medium-duty slicing needs, this Avantco automatic meat slicer is designed with the end user in mind! Easy to use and offered at an exceptional value, watch this video to learn more about how this slicer can help you increase your establishment's efficiency. Need to learn how to clean your meat slicer? 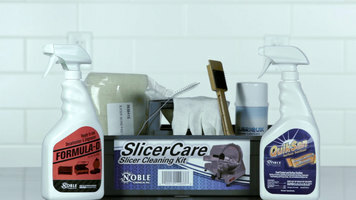 Check out this video to learn about our slicer cleaning kit! See all that’s included and follow Chef Matt’s step-by-step instructions. 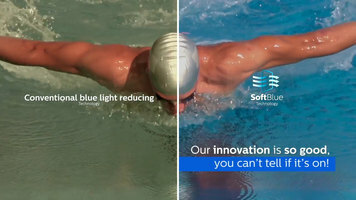 Protect your eyes from harmful blue light with Phillips SoftBlue technology! Check out this quick how-to video for creating and printing customized labels from Avery!